To be a player playing in the NBA Finals, it is clear that you have a few things about you. Not every player on the court or on the roster for the teams will be the fan favourite or the player that everyone knows about but to be in a position where you can get game time in an NBA Finals indicates you have something about you. Skill, talent and determination are all vital components of a successful basketball player but sometimes there is an added edge to a player’s locker when they take to the court in a NBA Final. It would be fair to say that Kawhi Leonard won’t have too many happy memories of the 2013 NBA Finals. It looked as though the Spurs were going to triumph but a collapse in Game 6 saw the Heat come from behind and clinch victory, eventually clinching the Championship. With Leonard one of the players singled out for criticism due to a last minute miss, he could have crumbled under the pressure. It took Leonard a couple of games to find his stride in the 2014 NBA Finals but after Game 2, and with the score tied at 1-1, Leonard went into over-drive and the Spurs never looked back. The blend of young and old in the Spurs team is perfectly encapsulated by the fact that at 22 years old, Leonard is the youngest winner of the NBA Finals MVP award since team-mate Tim Duncan clinched it back in 1999. Leonard is the fourth youngest winner in total to have clinched the MVP, with Magic Johnson having won it twice at an age that is younger than Leonard. That is not bad company to be in! One of the things you noticed from the end of the game celebrations, and the moment when Leonard was announced as the MVP, was the reaction of his team-mates. This was a time when all of the players would have been forgiven for being locked in their own moment of celebration, but as soon as the announcement was made, they rushed to Leonard. There was a broad smile and even laughter from the coach of Spurs, Gregg Popovich, which he later attributed to the fact that Leonard would now be placed into a position where he would have to speak to the media. While some basketball players are comfortable in wise-cracking and giving soundbites to the media, there are some who feel much more comfortable doing their talking on the court. This is undoubtedly where Kawhi Leonard likes to do most of his talking but as a hot commodity in the sport, he’ll find that the media have a strong interest in what he has to say. 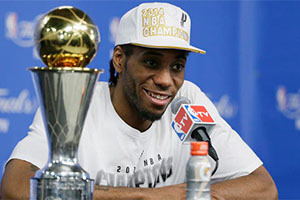 While the scoring exploits of Leonard was a big factor in the awarding of the MVP title, he also played a role in shackling the Heat and LeBron James. James was by far the biggest player for the Heat and while he performed admirably, he wasn’t in the game or as connected to his team-mates as he would have liked to have been. Just before the end of the game, James led some of his colleagues to the Spurs bench to congratulate the new champions and the first player that Leonard looked for was James. Given that LeBron has received the previous two MVP awards for the NBA Finals, it was almost a passing of the flame moment and one that encapsulated so much of the 2014 NBA Finals.